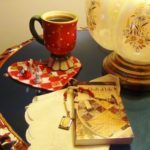 Until a few years ago, I never really cared about decorating my home. My mom, however, loved (and still loves!) going to Home Goods and buying decorations for her home. In the fall, she’ll buy nicely-dressed scarecrows to place outside, and in the winter, she’ll buy way too many Santa Claus dolls. When I was younger, I was often annoyed by the season-themed excessive decorations, but I really enjoy them now. Sometimes, I’ll even go into Home Goods and imagine how I would decorate my own home. So, as the spring shifts into summer, it’s time to start redecorating our homes to reflect the hot and sunny days! My mom loves the summer because she has so many ideas for our summer kitchen decor. From bright and vibrant wall art to dishcloths, she always finds something to place in our kitchen. However, she never creates her own decor, and I think it’s more exciting to create your own summer kitchen crafts. If you want to redecorate your home for the summer, you should check out these 19 Summer Kitchen Crafts! 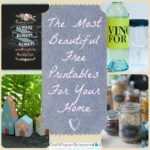 This collection of kitchen crafts provides so many ideas that you’ll absolutely love, no matter what type of craft you enjoy. Love to crochet? 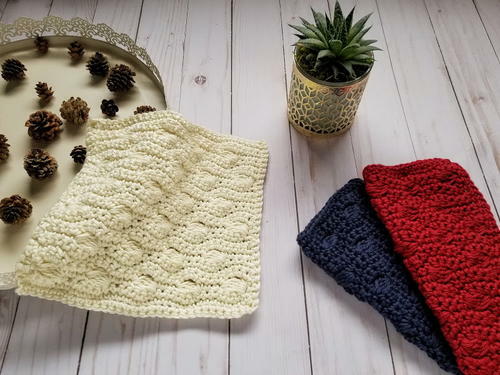 Make one of these crochet dishcloths. Love to organize? Craft one of these DIY organizers. 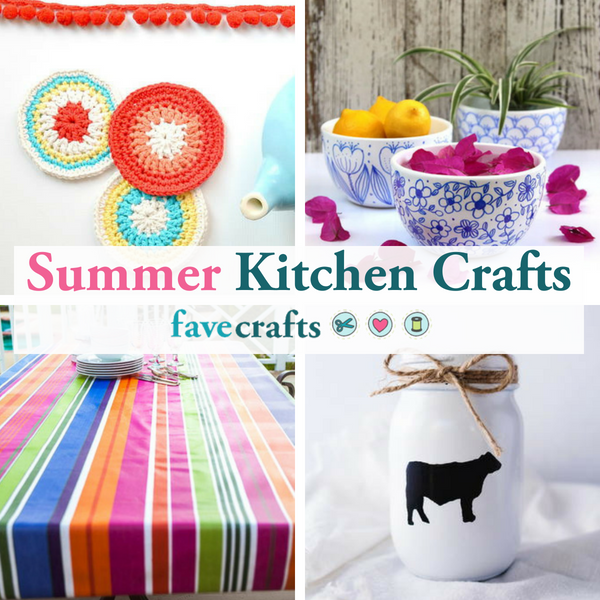 This summer kitchen crafts list has all types of projects that you’ll enjoy. 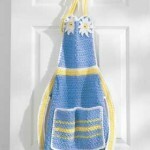 And these kitchen crafts use such colorful materials that it’ll feel like summer in your kitchen. 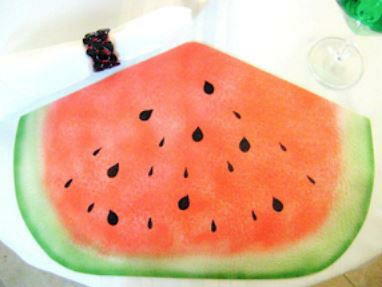 So, brighten up your home with these summer kitchen crafts! What are some of your favorite seasonal crafts? When you think of craft supplies, you likely envision markers in an assortment of bright colors, glittery sequins, and colorful beads. But what about felt? The unsung hero of craft supplies, felt is sturdy and flexible, and can be folded, sewn, and cut into decorations, accessories, and so much more. Despite its versatility and ease of use, this material is one that you might not be using all that frequently. So why not shake things up a bit? This year, you’ll want to put spring felt projects at the top of your crafting to-do list. Easter is almost here! Are you ready? If you could use some cute decorations for the holiday (and who couldn’t?!? ), then take another look at felt. While you could use paper to make decorations, it’s important to keep in mind that the material has a fleece-like feel to it. There really isn’t a better option for making fuzzy lambs, ducks, and bunnies! 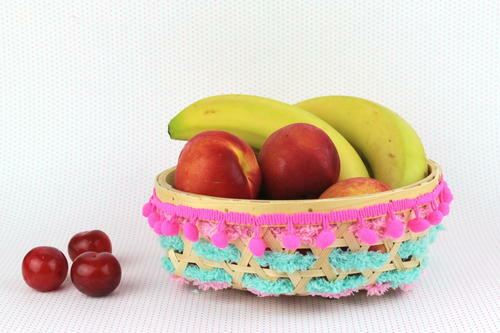 Your Easter felt crafts will look and feel soft. In addition, these projects will be an adorable addition to the festivities. The calendar might say it’s spring, but you might live in an area where warm weather and blooming flowers won’t return for a while. 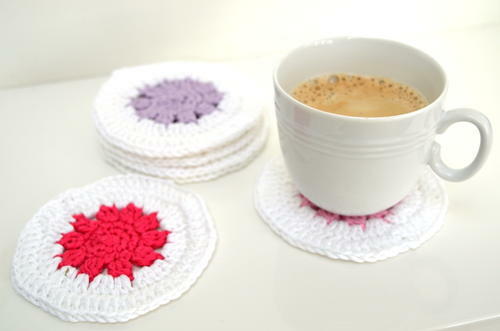 With that in mind, you can still add flowers to your home when you make flower felt projects. The material can be folded over and over in an assortment of ways without losing its shape, resulting in a design that is both intricate and unique. The softness of the material also gives the flower a more realistic appearance, too. When selecting colors for your flower felt project, consider opting for material in vibrant colors. Need a little help on creating felt flowers? 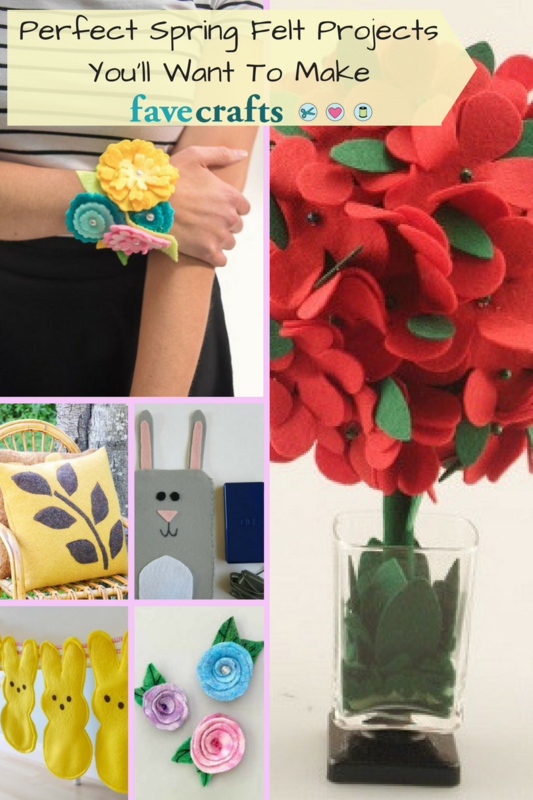 This video tutorial on the Felt Flower Corsage Craft can get you started. Are you in the midst of spring cleaning and have discovered sweaters that have seen better days? Don’t pitch those sweaters! 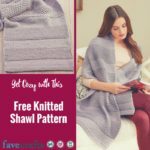 You can repurpose those sweaters and other knit or crochet items into felt, which can be used for future craft projects or repurposed into comfortable pillows or other home décor items. And how do you make felt, anyway? Whether you want to toss that old sweater in hot water or use another method, our helpful guide on felting can get you started. 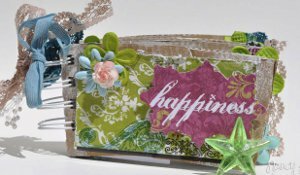 Reusing a beloved item in a new way is eco-friendly and an inexpensive way to add to your craft supplies. Win-win! Welcome warmer weather with Posies for My Toesies Shoe Embellishment! Feeling inspired? If you’re looking for felt projects to make, then you’ll want to check out our list of ideas! Many of these projects are easy to make, so you could work on a spring felt project with your child. Easter Bunny Decor — Too cute! Felt Rose — So colorful! No Sew Felt Flower Ornament — Kids will love making this one! Felt Princess Flower Crown — What a dreamy and romantic felt craft project! What is your favorite spring felt? Let me get something off my chest. I am so happy to see the return of spring. Winter in my area can be drab and dreary, especially as the sun sets long before dinnertime. As a result of this dismal weather, I’m ready to say goodbye to bare trees and sad patches of snow. I am counting down the days until I can say hello to clear skies and plenty of sunshine! This year, I’m doing something a bit different. I’m digging into the craft supply box to make flower crafts with my kids because I want to celebrate spring’s return. From crochet granny squares to coloring sheets, these cute flower craft activities are perfect for my family because they are kid-friendly, super colorful, and generally inexpensive. It’s win-win-win for everyone. In addition, we gain a sense of accomplishment and pride by completing a project. It doesn’t also hurt that we also get to brighten our home with flower craft patterns we’ve made by hand. With the plethora of flower craft ideas available on FaveCrafts, you’re probably wondering where you can even start finding a project. What’s a crafter to do? I’ve curated a list of flower craft activities for you to explore. This list includes some paper flower crafts for younger kids that will be fun to work on together with adult supervision. In addition, I’ve selected a few flower craft projects for adults and teens that are more time-intensive, because who isn’t up for a challenge? This list of flower craft activities is also the perfect opportunity to try a type of craft that’s new to you. 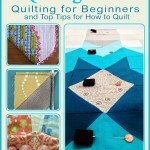 Ever wanted to learn how to crochet or spend the afternoon working on coloring sheets? All you need to do is round up your materials, then roll up your sleeves and get to work. Finally, just remember to have fun when crafting with your kids! 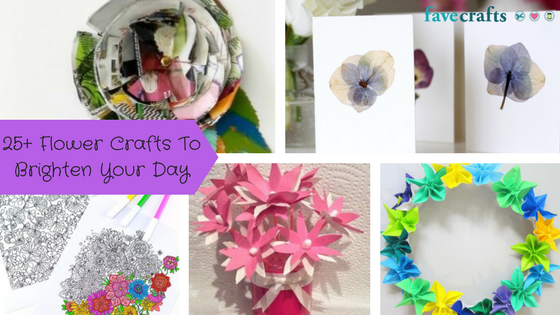 You’ll love adding some serious flower power to your kitchen table or work space with these amazing flower crafts. 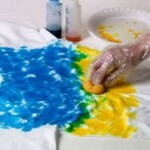 In addition, you and your kids can make duplicates of your favorite craft projects to share with family and neighbors. Most of all, who wouldn’t want their day brightened with colorful paper flowers or flower pots in bright designs? Celebrate the start of spring with these flower crafts! Clockwise from top left: Junk Mail DIY Wall Art, DIY Pressed Flower Cards, Origami Spring Wreath Idea, Mini Q-Tip Flowers, Summer Bouquet Coloring Sheets. 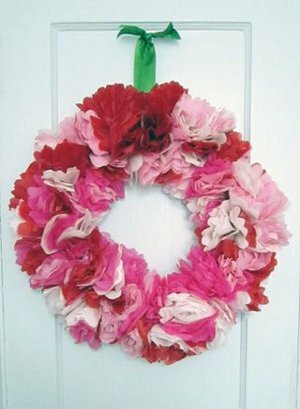 Add a pop of color to your front door with the Peony Wreath craft project. Summer Bouquet Coloring Sheets — Grab your favorite markers and pencils for this project! Flowery DIY Wall Art — What a neat design idea! Mini Q-Tip Flowers — These are so creative! Origami Spring Wreath Idea — If you love origami, then you NEED to try this project. Hello There Flower Pot Crafts — Won’t these look amazing on your deck or patio? What are some of your favorite flower craft projects? Oh, the beautiful sea. It’s no wonder why the ocean is an inspiration for many writers, musicians, artists, and poets. One of nature’s most beautiful gifts is that big blue mass of water and all the treasures it contains. With this DIY nautical art, you can practically close your eyes and feel that breeze rolling off the ocean. If you are planning a beachy trip, make “shore” you collect shells for this DIY nautical décor (as long as it’s legal at your beach). You can also dress in the loveliest crochet accessories that would make a sailor blush (because of your beauty). Even in the cooler months, the ocean can provide feelings of relaxation and adventure. Bring some of that nautical inspiration into your home with these beach crafts, and you will feel as happy as a clam. 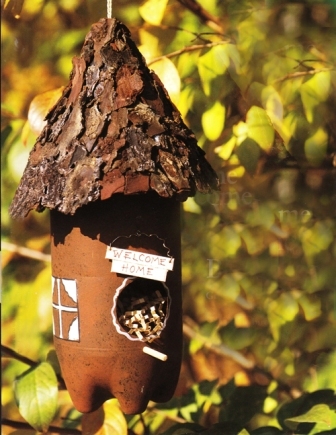 Best of all, many of these crafts utilize recycled material, so you will be saving the ocean as you create. Nautical inspiration is in style, so jump on board and let your creativity test the waters. These beautiful wall art ideas will make you feel right at home by the sea. 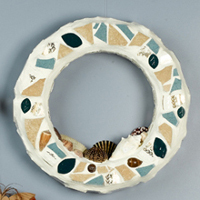 Whether you like seashells or sea glass, you will love this DIY nautical wall art. Everything from candles to recycled bottles can be found in this charming collection of DIY nautical décor. In the morning by the sea, or wherever you are, you can enjoy the sensations of beach like through these décor ideas. Live your life as the islanders do and take some time out of your day to just chill. These free crochet patterns are inspired by the big blue and will help you feel cozy as you’re dreaming of the sea breeze. 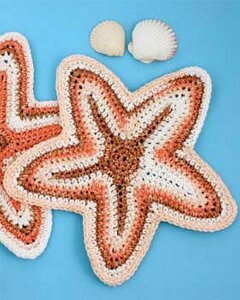 Enjoy these crochet patterns that will wrap you under an afghan and take you under the sea. As John Denver once sang, “To live on the land, we must learn from the sea.” These DIY nautical accessories will help you keep that oceanic wisdom with you wherever you go. Create a necklace to help you remember past trips to the shore or create a shirt to wear on your next vacation. 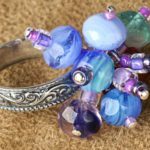 With these crochet and jewelry patterns and your imagination, you will emulate the spirit of the sea to everyone you meet. Greet every day with a smile and the song of the ocean in your heart with these DIY nautical accessories and apparel. 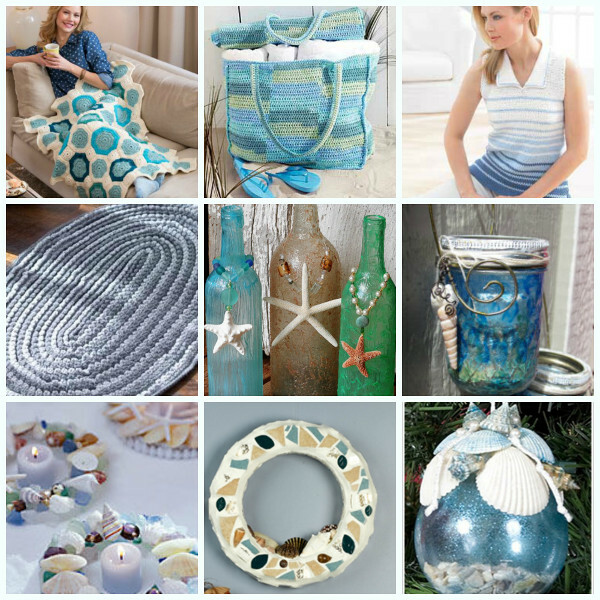 If you love this DIY nautical décor and accessories, check out these Top 20 Craft Ideas for Seashells and 19 Beach Crafts for the Home. Which is your favorite beach to visit? When I was younger, the first week of August was usually when our family would head off for a vacation. During my adolescent and teen years, , we often ended up at the same beach-side hotel in Fort Lauderdale, FL. My mom’s favorite activity was collecting shells in a plastic bag – she would gather up her stash and show us her findings at the end of the day. 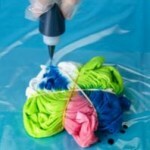 While a plastic bag is a convenient means of storage, there are so many (better) crafty options. This got me thinking – there must be people just like my mom who love to collect shells and other keepsakes but don’t know what to do next. Alternatively, there are plenty of DIY lovers who can’t get to the beach (that’s where your local craft store come in). 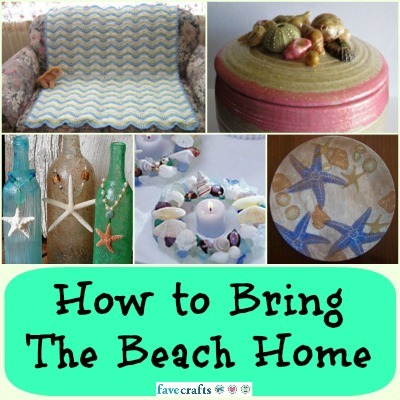 Now you can bring the beach home and create the ultimate summer crafts. Don’t worry yarn lovers – we haven’t forgotten about you. 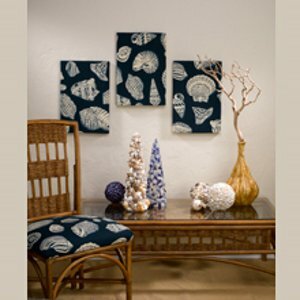 Bring out the best aspects of the beach in your afghan, scarf and wall decor designs. 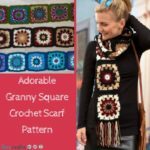 Cool colors and soft ripples turn an otherwise normal crochet or knitting pattern into a work of art. Ready to head to the beach? Leave the sunblock at home – you won’t need it for these genius DIY ideas. 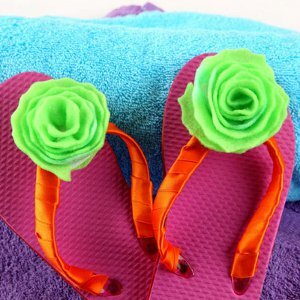 As mentioned earlier, you don’t have to hit the beach to find the best items for your summer crafts. Craft stores supply everything from shells to sand, so head to your favorite shop and get to work. Use the beach as inspiration when you crochet your next scarf or construct your next wreath. 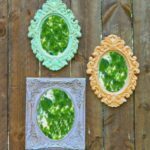 Fun summer crafts like these never go out of style, so you can leave them up well into the fall. Seashells aren’t just meant to be displayed in a jar or on a plate. Instead, use them for your craft projects. 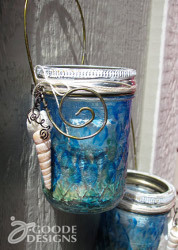 Use regular glue, decoupage and other adhesives to add colorful, iridescent seashells to your DIY designs. The added dimension adds depth and excitement to any handmade piece. The best thing about this time of the year is that everyone has fresh produce, cute animals, county fairs, and gardening on their minds. Wouldn’t it be lovely to live on an apple orchard with free-roaming chickens? Of course, not all of us are lucky enough to have that simple country lifestyle to themselves. However, with a few rustic crafts like a Carved Wood Farm Plaque, you can bring that farmhouse charm into your own home. No matter where your crafting skills lie, you will be able to find a DIY country craft that suits your talents and your lifestyle. 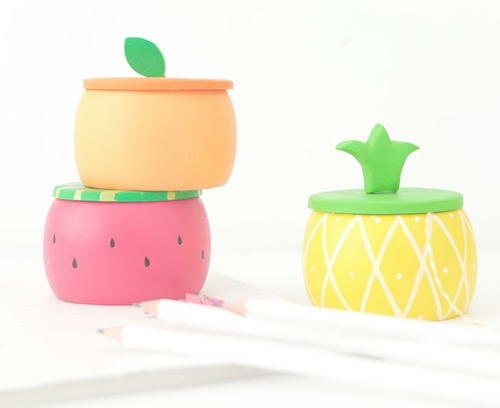 You don’t have to get up at the crack of dawn to make these cute crafts! One of these days, I’m going to be able to rise early in the morning and tend to my garden (and rabbits and ducks). I will have myself a hearty lunch and spend my free time enjoying the sights and sounds of farm life. I’m probably over-romanticizing it, but hey, a girl can dream! 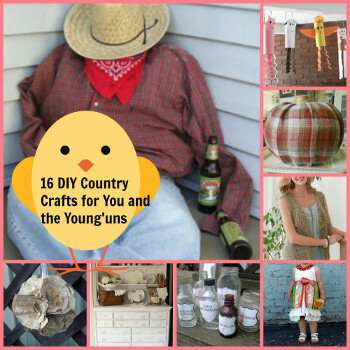 Until our country dreams come true, we can create DIY country décor and cute farm animals crafts. The simple life is just a craft away. Sit your little ones down at the table and watch them create a whole barnyard full of animals right before your very eyes. Don’t you think your daughter would look extra cute in a Little Farmer’s Market Dress while she works? You might even want to whip up a Lacy Anytime Vest to wear for yourself as well. 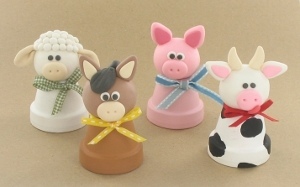 With the right attire, you will have all your new critters following you like Little Bo Peep. You can add a touch of vintage charm with these beautiful farmhouse-inspired decorations. 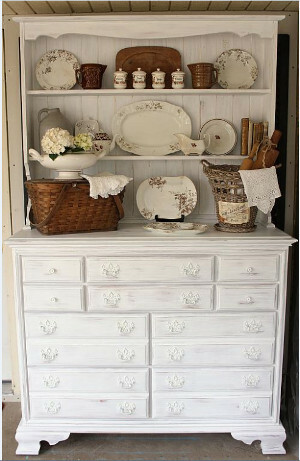 You will fall in love with your home all over again once you add a hand-painted cupboard or whimsical veggie figurines. From beautiful decorations to adorably useful knickknacks like Metallic Keys Stamped Clothespins, the aesthetic of rural living can be yours. Roll up your sleeves and transform your home into a picturesque paradise. Even if you don’t live on a farm, you can still care for your own little garden. So what if your only “animals” are earthworms and butterflies? This free eBook Garden Crafts will show you clever ways to decorate flower pots, plant stakes, watering cans, and more. Everything a suburban farmer (like you) needs is in this nifty free eBook. What types of animals and produce would be found on your dream farm? Oh, how I miss family camping trips. As a child, there was nothing more exciting than watching my parents pull sleeping bags, lanterns, and outdoor eating utensils out of a storage closet. My little brother and I would run around and try to remember what each object was for. My parents, of course, would be less than amused: “Get out of the way; this box is heavy!” “Chelsea, turn that lantern off or you’ll waste the battery!” Making camping preparations was just about as exciting as the actual trip itself. 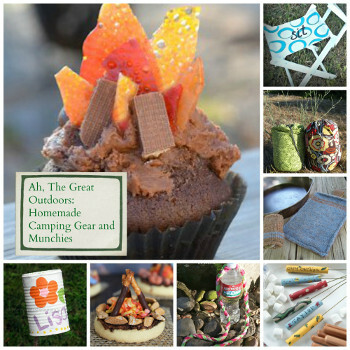 If you’re planning a campout this summer, try to make some of your own homemade camping gear. Your journey begins once you dust off a cooking set or unload cozy sleeping bags and when you discover the best s’mores recipe ever. And it will live on in the pages of a handmade travel journal. Make the absolute most out of your trip right from the start. These DIY camping ideas will make sure that your trip is as fun as it can be. Camping, of course, can be a stressful time, but we have everything you may need to bring right here, as well as a few snacks to enjoy. Let the kids be part of the fun with camping crafts for kids as well. Everything from cooking sets and sleeping bags to hand warmers and simple campfire seating can be found in this handy must-have camping list. 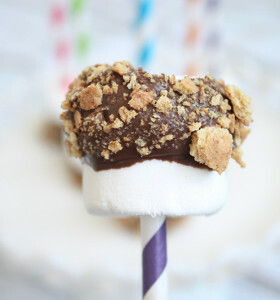 I hope you’re not expecting something “healthy.” These delicious snacks for camping will satisfy your adventurer’s sweet tooth and include the best s’mores recipe ever. If you want to try a little something different and stray from oatmeal raisin cookies, then try making a few campfire cupcakes. As you make them at home, you’ll grow even more excited for your trip. Just make sure you don’t eat them all before you leave! No camping trip is complete without a special place to store all your memories. If scrapbooking isn’t your thing, consider making a travel journal to jot down a few funny stories or tape in some canoeing tickets. These woodsy journals are perfect for you to tote along on your trip. BONUS! If you need a few extra crafts to keep the kids busy while you’re setting up camp or trying to pack, download our free eBook: 22 Summer Crafts for Kids. I bet my parents wish they had this when they were trying to load the minivan! What is on your list of must-have camping gear? And at last, we see the light! With these beautiful glowing crafts, you can learn how to make a lantern, tiki torches, votives, and more. Every summer needs an extra special glow. Whether you’re throwing an outdoor party or barbecue, or planning on going camping, be sure to plan for some magical summer lighting. The enchantment of paper lanterns, glowing jars, and critters for kids can be all yours this summer. 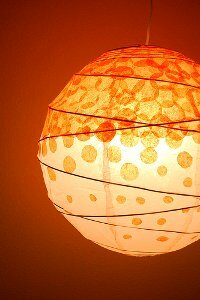 Nothing says summertime romance like a beautiful paper lantern. Even though these don’t float into the air like Rapunzel’s did, they are still lovely and will give any summer gathering a magical feel. Some are round, some are square, some are tall, and some are short. Whatever your lighting needs may be, there is a lantern waiting to be made with your hands. Shiny glass is just the right touch for a glowing flame. 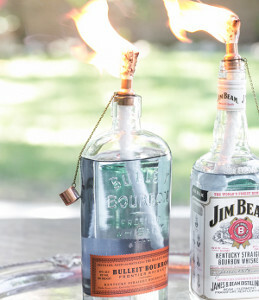 These crafts will help you combine two beautiful elements: fire and glass. Tiki torches are the most festive outdoor lighting for the summer, and you can use them again and again. Votives are clever crafts that book your decorating skills to the test. Don’t fret if you live in the city, because you can also create special star lights and lanterns that will turn your walls (or the roof of your tent) into a starry sky on a cloudy night. Don’t hog all the lighthearted whimsy to yourself. These DIY night lights are perfect for the kids to help you with. 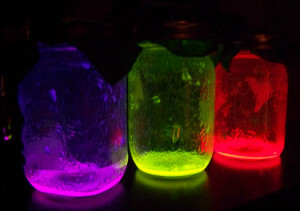 They can make colored Mason jars, fun glowing critters, and create there own starry sky lanterns. 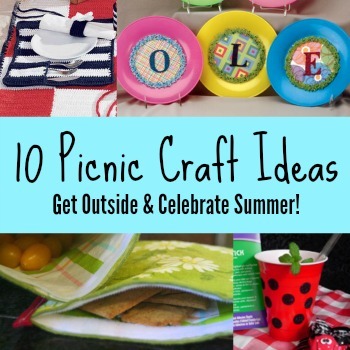 These crafts are perfect for the family camping trip or an outdoor sleepover. No matter what you do this summer, make sure the younger ones get a taste of summertime enchantment for themselves. BONUS: Find more DIY summer decorations and a few tasty recipes! Our free eBook 12 Fabulous Picnic Craft Ideas + Restaurant Copycat Recipes has everything you need to plan the perfect outdoor picnic. Let your craftiness shine! DOUBLE BONUS: If you want to turn “junk” into more fun projects, have some a little extra crafty summer fun with 32 Recycle Crafts for Kids. 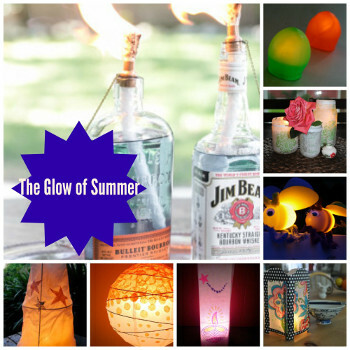 Which glowing summer craft is your favorite and why? The weather is warm and the days are longer, which can only mean one thing … it’s finally summer! There’s nothing worse than spending time indoors when you could be soaking up the sun (just make sure you wear sunscreen). Head out for a picnic this summer and soak up all of the best aspects of summer. You can go for lunch, in the late afternoon or even enjoy the sunset during dinner time. No matter when you head out, you’ll surely create lasting memories, especially when you add a DIY element into your outing. 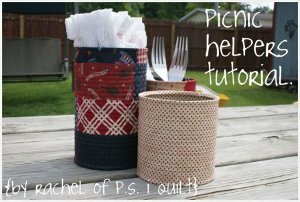 Picnic craft ideas can turn a plain old summer evening into an unforgettable event. Best of all, you don’t have to spend an arm and a leg on any of these fun summer crafts – save that for your family’s summer vacation! 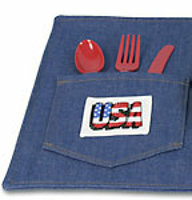 Before you head out, take some time to create your own picnic blanket, utensil holders and more. 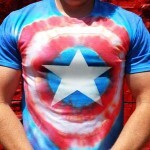 Also, don’t forget that the Fourth of July is just one month away, so be sure to incorporate some red, white and blue into your picnic crafts. 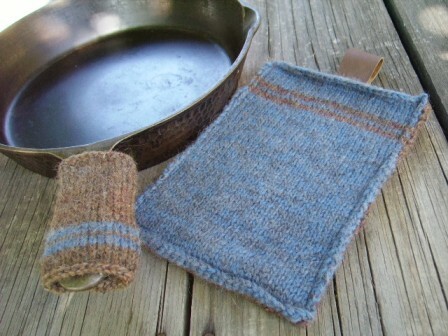 Make a beer bottle holder for dad, reusable cloth bags for kids (keep them for school lunches!) and a crochet tote that you can wear all year long. 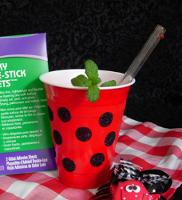 You can even create a theme for your picnic – choose a few portable ladybug crafts to bring on your audience – they can serve as a complement to those Spotted Ladybug Picnic Cups! Before you head out for a picnic, download a copy of “12 Fabulous Picnic Craft Ideas + Restaurant Copycat Recipes“. We joined up with our friends at AllFreeCopycatRecipes to bring you our favorite picnic craft ideas and recipes – you’ll want to save this one forever! What’s your favorite way to celebrate summer?